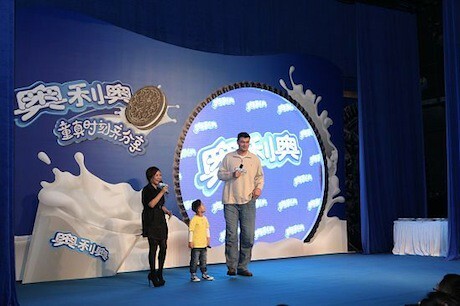 A few days ago Yao did a promotional program for the popular cookie OREO for Kraft Food’s Nabisco division in Shanghai. 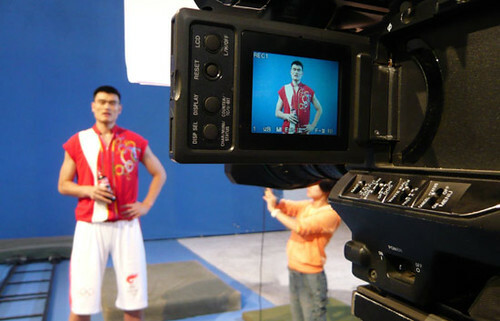 Yao is a spokesperson for the brand, and in the interview revealed a few things about his daughter Amy that we hadn’t heard before. Yao said Amy hasn’t yet shown early signs of her parents’ athleticism, but does seem to have some musical talent, singing and swinging to the beat of music. Yao joked that Amy already has him beat in the music department. 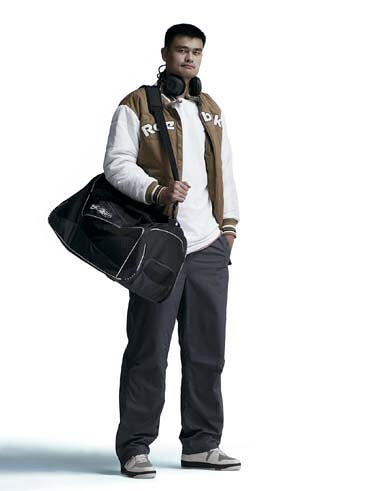 When asked about his life after retirement, Yao said he is as busy as ever. The most enjoyable time of his day is dinner time where he can relax and enjoy time with his whole family together: his parents, his wife, Amy, and sometimes his wife’s parents as well. Click here for more photos and information from the interview and the event. Thanks to Raymond in China for all the scoop. 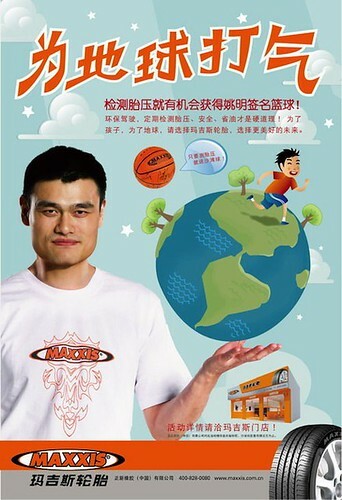 As many of you know, Yao Ming owns his old basketball team, the Shanghai MAXXIS Sharks. MAXXIS is a Chinese tire company that is obviously the team’s sponsor. Earlier this week, Yao and MAXXIS announced the launch of a “Cheer for Earth” initiative to help reduce carbon emissions through fuel efficiency. Because tire pressure has an impact on fuel efficiency, MAXXIS is offering free tire pressure checks and tire inflation at more than 1,000 stores throughout China in July and August. More than 150,000 customers have taken advantage of the promotion to date, saving an estimated 61,965 tons in carbon emissions. Who said China doesn’t care about it’s carbon footprint? This MAXXIS initiative may be small in relation to all of the carbon that China emits, but at least it gives you a glimpse within the country that there is acknowledgment more needs to be done. For more photos from the press conference, click here. Yao is in Athens for some of the Special Olympics (he’s a Global Ambassador for the Games), which just started this past weekend. Raymond has posted some great pics in the forum. Former Rockets’ teammate Dikembe Mutombo is in Athens, too, since he’s a Global Ambassador for the Games. 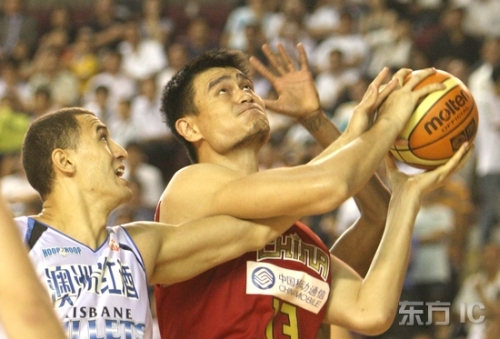 Both Yao and Deke played a little friendly game of one-on-one on Saturday. 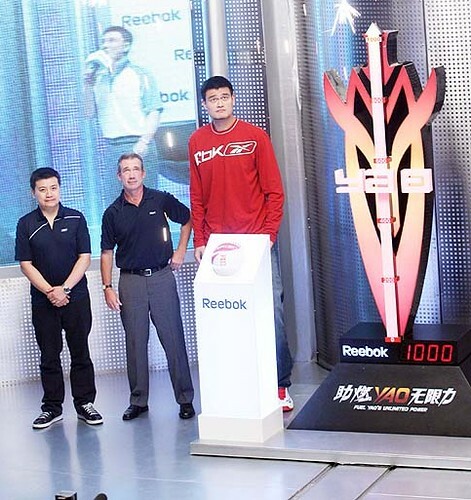 Click here for more photos of Yao and Deke together. 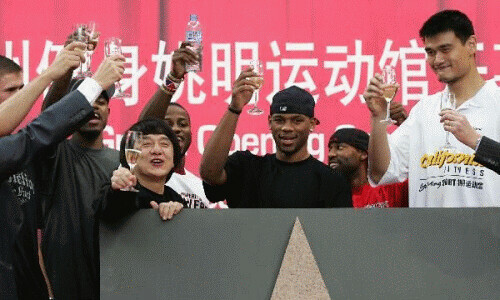 Later, Yao participated in the Opening Ceremony of the Games. Click here for some impressive photos from the Opening Ceremony. 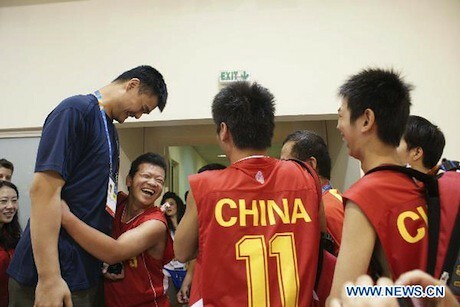 The next day (Sunday), Yao went to go cheer on the Chinese Special Olympics basketball team. 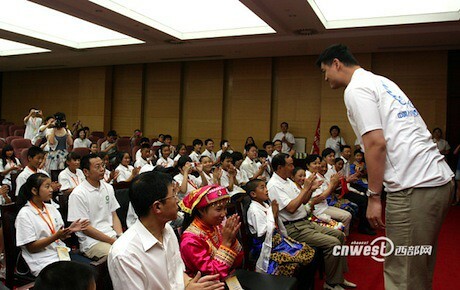 For more photos of Yao’s activities on Sunday, click here. The first part of the following video is a behind-the-scenes look at the making of the video above (spoken in Chinese). 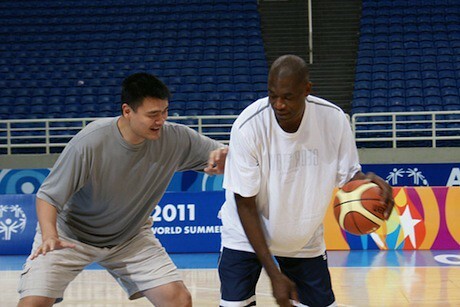 The white, bald guy lighting the Olympic torch with Yao is Yao’s trainer Anthony Falsone. Thanks always to Raymond in China for finding these vids. 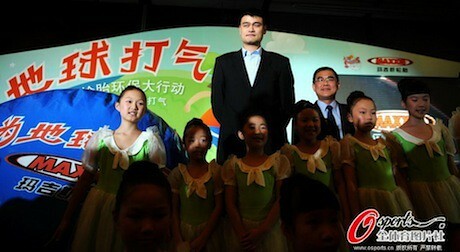 On Tuesday Yao Ming became the global image spokesperson for the China Life insurance company. Add this to the other companies he added to his involvement the other day. Click here for more photos from the press conference. 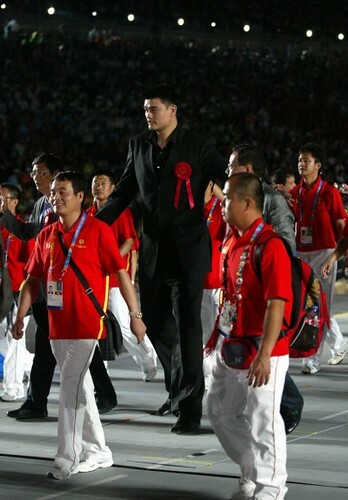 Yao Ming has been one busy fella the past few days. Not only has he been doing his training for the Chinese team, participating in the festivities and auction for the charity gala — and play in that game — he quickly moved from those activities into some commercial ones. 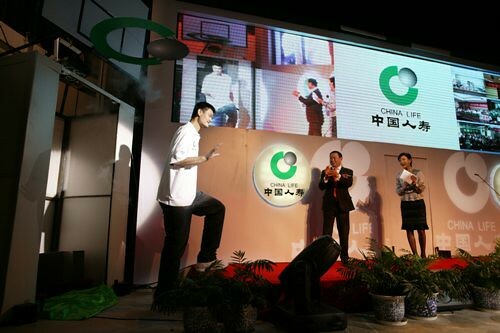 Below is a photo of Yao opening up his California Fitness concept in Beijing (click here for the article when it was announced in May), with participation in the launch of the fitness center by Jackie Chan and many of the players who came over from the U.S. for the charity game. 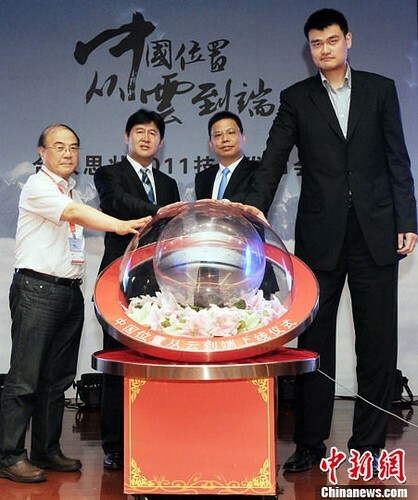 Before this event, Yao attended a ceremony held by Visa International and China Construction Bank to launch the CBC Visa Ming card, with Yao Ming also being named Visa’s global image spokesperson. He also attended the press conference held between the NBA and KongZhong Corporation to announce a new mobile WAP-based service that will provide NBA fans in China with a broad range of content options including news, scores, editorial content, player interviews, TV schedules, wallpapers, ring tones, video clips and live NBA games. You are currently browsing the archives for the Spokesperson category.